The Dagger Mamba - A Whitewater River Running Kayak - Haba Naija! The Dagger Mamba underwent a redesign just over a year ago which gave it a rebirth as a top of the range kayak for serious paddlers offering extreme levels of performance and strength. 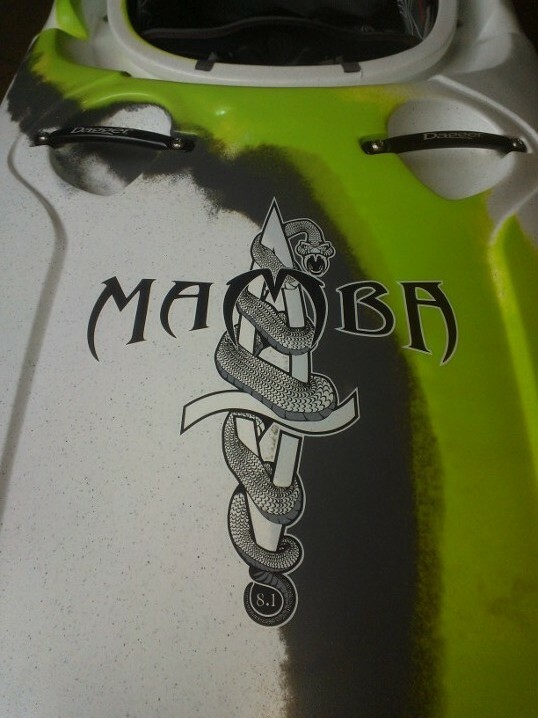 Last year they released the new Contour Ergo outfitting which was a dramatic improvement on any alternative outfitting on the market, so now when you look at a Dagger Mamba, you are looking at THE top spec boat out there. OK I understand that opinions from certain paddlers differ depending on their own previous use of boats but there is no denying that the new outfitting looks the part and is nearly too comfortable to be in a kayak. This boat comes in two specs; a River version which is ideal for the intermediate paddler who paddles a variety of water and may want to make use of fast outfitting adjustment, and also the Creek version which is more bomb proof for those top class paddlers. Externally both specs are the same but internally there are a few key differences. The creek seat has everything bolted down, so it is slower to adjust, because those waterfall bombers out there need solid fixation guaranteed. Whereas the River version has quick fore and aft adjustment allowing you to alter trim on the go, so one minute you can be surfing, the next running a drop with minimal adjustment time to get the perfect contact and trim for yourself. Also the Creek version has a Heavier ‘Step out’ pillar and the River has the lighter weight Foam Pillar. they are the same boat but in two different sizes.